A ban on new supergraphic signs was the star attraction this past Tuesday when Hollywood sign district revisions came before the City Council, which might explain why almost everyone either ignored or missed the fact that those revisions adopted by unanimous vote could allow a four-fold increase in the number of large Times Square-style electronic signs running ads for products and services 24 hours a day. 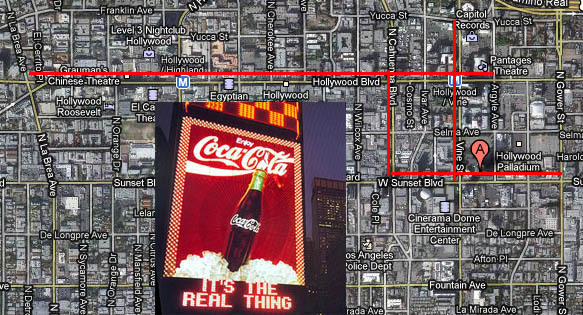 The sign district regulations originally adopted in 2004 allowed digital wall signs of up to 300 square feet on sections of Hollywood Blvd., Sunset Blvd., Cahuenga Blvd., and Vine St. However, those signs were restricted to buildings occupied by theaters of at least 300 seats or entertainment-related businesses with a floor area of at least 15,000 sq. ft. While it is difficult to arrive at an exact figure, best estimates are that at most a dozen buildings might qualify. The new ordinance adopted Tuesday drops the restrictions to theaters and entertainment businesses, although a limit of two 300 sq. ft. signs per block on the aforementioned streets remains. That means a potential total of 50 signs in the 25 designated blocks on those streets, or a total of 15,000 square feet that can display both on-site and off-site advertising on signs approximately one-half the size of a full-sized billboard. One speaker raised this possibility at the City Council meeting, but Council President Eric Garcetti responded that the original regulations governing electronic signs “have not changed.” He went on to assure the public and fellow councilmembers that the new regulations would not allow conversion of conventional billboards in Hollywood to digital, although that was beside the point of the speaker’s comment. While the City Council’s action significantly increases the number of electronic signs allowed, it is a huge departure from the sign district revisions approved in August by the City Planning Commission, which eliminated the provision for electronic wall signs altogether, and limited digital displays to existing theater marquees. Other commission recommendations were rejected by the City Council as well. The most notable would have limited the total of existing new and supergraphic signs to 60, and restricted them to two relatively small areas of central Hollywood. Because 32 signs now exist and 16 more proposed have been “grandfathered,” the council action caps the total number at 48, or 12 fewer than the commission recommended. Would those 12 would have been more onerous than 30 or 40 new electronic signs running video ads 24 hours a day? The City Council’s action also jettisoned the billboard takedown program, which gave companies credits toward new supergraphic signage in return for removing conventional pole signs, roof signs, and billboards. The planning commission devoted considerable time to discussing the importance of keeping this program in place in order to remove blight in the form of billboards from Hollywood neighborhoods.